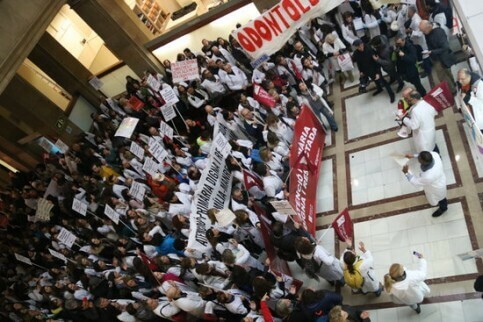 Medical staff in Catalonia are continuing a week-long strike that began on Monday over excessive workload and poor conditions. Emergencies will be guaranteed, as well as special services, such as chemotherapy and hemodialysis. Other departments will provide 25% minimum services. Health workers blocked the Gran Via de les Corts Catalanes, one of Barcelona’s main avenues, and occupied the headquarters of Catalonia’s Health Institute (ICS). Around 5,700 doctors working in public health centers were called on to join the protest, including gynecologists, pediatricians, odontologists, and family doctors, as well as some 10,000 physicians at public-private centers. 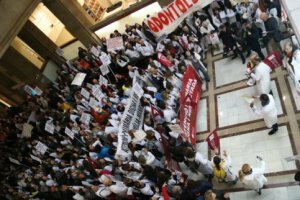 The Metges de Catalunya union said participation in the strike was at 77.3%, while the Catalan government estimates that 44.76% of health professionals joined the action. In a decade-long dispute, unions condemn poor working conditions that harm the quality of the service. Demands include reducing the number of visits to 28 patients per day, and to spend at least 12 minutes with each person. The situation was compounded by cutbacks of salaries and staff numbers following the 2008 financial crisis. Health professionals want the administration to hire 920 workers fired during the recession and to reverse a 30% wage reduction. With many people no doubt wondering how the strike might affect them, the health department advises the public who have an appointment to either call their centre first or go there in person to confirm whether they can see their doctor. If it is not possible to see the doctor, then a new appointment should be scheduled by phone, online or in person. In Primary Care Centres (CAP) on Monday, the public accepted the health workers’ strike with resignation. According to doctor Anna Franco, at the Manso CAP in Barcelona, ‘users are very polite, you explain the demands and they support them, they wish us luck,’ she said, adding that the public understands that it is ‘to better attend patients’.